Cindy Hval with Myrt and Walt Powers and Harold and Shirley Tucker. 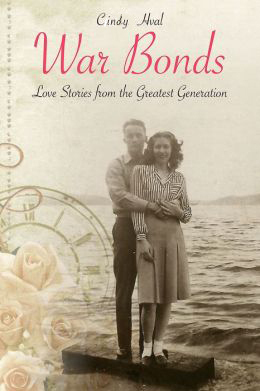 Last night, two couples featured in War Bonds Love Stories From the Greatest Generation were guests at Spokane Veterans Forum. The Veterans Forum is a group of veterans and Gold Star Mothers who serve as mentors to men and women coming through the Spokane Veterans Court. Organizers showed the Northwest Profiles video featuring the two couples and then I facilitated a discussion about relationships during and after military service. The veterans and their mentors proved to be a warm and responsive crowd and gave the Powers and the Tuckers a standing ovation at the conclusion of our discussion. How wonderful to see these members of the Greatest Generation honored, respected and valued for the wisdom they have to offer us.